On Dec. 1, 2016, NASA astronaut Catherine “Cady” Coleman announced her retirement from the agency via social media. Since becoming an astronaut in 1992, she has logged over 180 days in space across two Space Shuttle missions and one International Space Station (ISS) expedition. According to her NASA biography, Coleman received a bachelor’s degree in chemistry from the Massachusetts Institute of Technology in 1983. That year, she also was commissioned as a second lieutenant in the U.S. Air Force and began graduate work at the University of Massachusetts. She completed a doctorate in polymer science and engineering in 1991. Her research focused on polymer synthesis. In 1988, Coleman entered active duty with the Air Force at Wright-Patterson Air Force Base, serving as a research chemist at the Materials Directorate of the Wright Laboratory. She also acted as a surface analysis consultant for NASA’s Long Duration Exposure Facility. Coleman set several endurance and tolerance records as a volunteer test subject for the centrifuge program at the Crew Systems Directorate of the Armstrong Aeromedical Laboratory (now part of the Air Force Research Laboratory / AFRL). Coleman retired from the Air Force in November 2009 as a major. 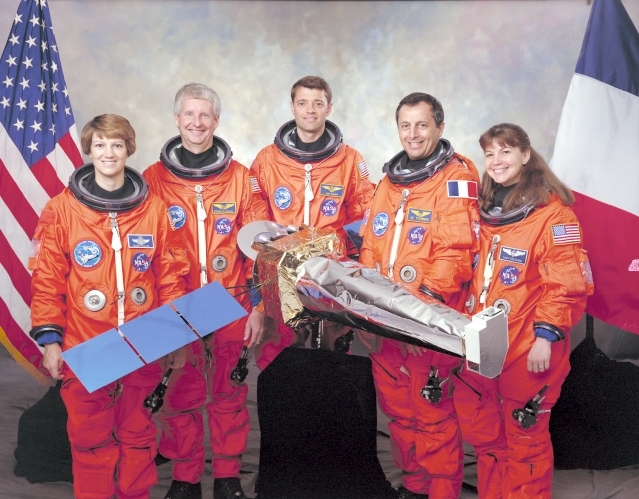 In March 1992, Coleman was selected as part of NASA’s 14th group of astronauts. She served Johnson Space Center in a variety of capacities including software verification, executive support to the Center Director, payload usability, habitability issues on the ISS – such as ensuring that the Russian segments of the ISS were labeled in English – as well as serving as CAPCOM in mission control for the Space Shuttle and the space station. Coleman represented the Astronaut Office on the Tile Repair Team as part of NASA’s Return to Flight following the 2003 Columbia accident. She also served as the Chief of Robotics for the Astronaut Office, where she supervised training astronauts on robotic systems and integrating crew interfaces into new robotics systems. Coleman served as a mission specialist on STS-73, trained to back up an injured mission specialist on STS-83, and was the lead mission specialist on STS-93, which deployed the Chandra X-Ray Observatory. Coleman was a backup crew member for ISS Expeditions 19, 20, 21, 24, and 25 as part of her training for Expeditions 26 and 27. STS-73 was the second United States Microgravity Laboratory mission aboard the Space Shuttle Columbia. It focused on materials science, biotechnology, combustion science, the physics of fluids, and multiple scientific experiments in the Spacelab module. During STS-93, Coleman deployed the Chandra X-Ray Observatory. The telescope continues to provide observations of the universe in the X-Ray frequency band, investigating exploding stars, quasars, and black holes. For ISS Expeditions 26 and 27, Coleman served as a flight engineer aboard the Russian Soyuz TMA-20 spacecraft for launch and landing and spent 159 days in space aboard the ISS. In addition to conducting science experiments and ISS system maintenance activities, she acted as the lead robotics and science officer. Coleman was the lead robotic arm operator who captured Kounotori, making it the second-ever free flyer robotic capture aboard the ISS. In addition to her mission-related activities, Coleman was the first person to perform a flute duet from space. She also served as a technical consultant to actress Sandra Bullock for the science fiction film Gravity, which won seven Academy Awards. Coleman logged more than 4,330 hours in space between her time on the Space Shuttle Columbia and the ISS. Words can’t express the respect and passion that I have for our NASA mission. I loved flying on the Space Shuttle, living on the International Space Station and seeing our Earth from those special vantage points. I’m so thankful to have been part of the NASA team that makes this possible. Now she’s a ‘mainstream media’ huckster mingling with the other commie con-artists like fraudulent code schools for kids and interviews with washed-up movie directors like James Cameron?? Everyone liked it when she was a real scientist and astronaut but the ‘MMM’ hustlers must pay her fast cash upfront into pocket now.